Round 4 started at 1am EST, Friday. Owen comes to the table with a snazzy new hair cut and a relatively unseen archtype for Standard thus far this season in Temur Emerge. The deck features Emrakul, the Promised End, Gather the Pack, Kozilek’s Return, Ishkanah, Grafwidow, Den Protector, Elder Deep Fiend, Jace, Vryn’s Prodigy, Pilgrim’s Eye, Nissa’s Pilgrimage, Chandra, Grapple with the Past and Gnarlwood Dryad. Ishkanah showing up in Temur certainly opens the door for the card to see more play. Andrew’s deck on the other hand is a version of the familiar GB Control style build including value cards such as Liliana, the Last Hope, Mindwrack Demon, Grasp of Darkness, Gilt-Leaf Winnower and Nissa, Vastwood Seer. After some back and forth, Owen takes Game 1 on the back of a late game Emrakul. In Game 2, Owen shows off Coax from the Blind Eternities, perhaps a sideboard option against Infinite Obliteration. Midway through Game 2, both players are still at 20 life, and Turtenwald has three copies of Elder Deep-Fiend in hand. Floor report has Liliana, the Last Hope selling at prices as high as $100. Dickmann is on a unique Bant brew with Reality Smasher, Elvish Visionary, Reflector Mage, Spell Queller and Drowner of Hope. He’s running Collected Company and Cryptolith Rites, despite running many creatures over three casting cost. Nelson is on a Jund deck with Emrakul, the Promised End, Kozilek’s Return, Traverse the Ulvenwald, Distended Mindbender. Emrakul getting a lot of camera time, and seems to be in many decks. Brad takes Game 1 with Emrakul in similar fashion to Owen at the other table. Dickmann takes Game 2 off camera. In Game 3, Brad gets off a Kozilek’s Return in the mid-game to clear most of Patrick’s board. He follows up with Ishkanah and sets up to run back the Return off a forthcoming Distended Mindbender. Spell Queller eats the Return, but Brad top decks Languish to clear the board. Reality Smasher comes off the top for Patrick however and with Brad at just three life, Dickmann puts the match away. Not many aggro decks at the top tables so far. Seck is on U/B Madness, using Voldaren Pariah. Camilluzzi is on a Naya build that leverages Thalia’s Lancers and a toolbox of legendary creatures to try and take control of the mid-game. Marco takes the match mostly off camera 2-0 in their games. Over a quarter of the field is caught still playing with time called. Format is slow! Randy notes that Bant Company is only 19% of the total field, as opposed to the expected 30-35%. Everyone gunning for it. As per usual, deck is built around Bant value creatures Duskwatch Recruiter, Spell Queller, and Reflector Mage coming into play via Collected Company. Reid Duke is basically on an old school red/green ramp deck, using green ramp spells, Hedron Crawler and Hedron Archive to get to Ulvenwald Hydra (one copy), Dragonlord Atarka and Emrakul, the Promised End. At the low end he runs Sylvan Advocate, Fiery Impulse and other board stabilizing cards. Sperling is making use of many of the green and black delirium cards, leveraging the graveyard and various card selection, discard and kill spells to try and control the mid-game. The deck also features Languish, Liliana, The Last Hope, Nissa, Vastwood Seer and the rest of the expected cards of the archetype. Traverse the Ulvenwald into Emrakul, the Promised End is also part of the game plan. Traverse is looking like an important card in this meta. In Game 1, Reid manages to get his Emrakul out a turn before Sperling and quickly earns a concession with Atarka also on his side. Between games I checked out the movement on Emarkul, the Promised End, and watched 20-30 copies dry up under $15. Channel Fireball is sold out. This card could be over $20 by end of the weekend if it stays prevalent near the top tables. Reid manages to take down Game 2 in similar fashion, this time getting in with Atarka before Sperling can stabilize. We come into this match in Game 3, with the players tied at a game a piece. Carvalho is on a full-fledged blue/black zombie deck. Deck runs the full set of Prized Amalgam, discarding them to Haunted Dead and Stitchwing Skaab (!) for major value. Crypt Breaker is also present, as is Voldaren Pariah, which at $1, certainly has room to move up if it does well. Indeed, the card is absolutely savage in the third game and earns a place on the must watch list for the weekend as Carvalho takes the match. Calcano’s deck is running Elder Deep Fiend, a card rarely seen in Bant Company, and further evidence of players looking to go bigger this weekend. At end of Round 2, more than half (!) the matches are still going. Ultra grindy indeed. LSV is running a fairly stock Bant Company list with a few tweaks. Defending Pro Tour champion Rubin is on a GB Delirium list running many of the same cards already expected. Rubin takes Game 1 fairly easily. LSV crack back in the next game to even things up. In the third game things get very grindy, with LSV trying to fight through Ishkanah and Void Winnower to get rid of a threatening Liliana, the Last Hope. The solution ends up being Tamiyo, Field Researcher, which allows LSV to tap down the big blockers and get in to kill both Liliana and a flipped Nissa. Nevertheless, Steve does get off an Emrakul on the next turn that absolutely wrecks his opponent’s board state, including an Ojutai’s Command countering a Reflector Mage. Rubin is able to put it away and advance to 6-0. A great game. The Watanabe deck is similar in some ways to the one Reid Duke is running, but with a few twists, including Hangarback Walker, and Ishkanah, Grafwidow. At one point Yuuya takes control of Dickmann using Emrakul and forces him to use Reflector Mage to give him back the Emrakul for another go at mind control. Savage, but Dickmann does manage to take the next game to even things out. 100+ copies of Emrakul, the Promised End have now evaporated across the online vendors after being constantly featured as the finisher of choice across multiple decks. The price looks likely to settle above $25 if the pace of camera time continues and it makes Top 8 in quantity. At another table, Owen Turtenwald beats Reid Duke, to put Temur Emerge at 3-0, and Owen at 6-0 on the day. A great start for our newest Hall of Fame member. Gather the Pack, Grapple the Past, Traverse the Ulvenwald, are all 4-ofs, as is Jace, Vryn’s Prodigy. Three copies of Noose Constrictor and a single copy of Nissa, Vastwood Seer. Prized Amalgam and Haunted Dead are also four copies each, providing a recursive value engine we’ve seen in a few decks now. Haunted Dead and Prize Amalgam could both end up in the $3-4 range. Kozilek’s Return, and Elder Deep-Fiend are also 4-ofs and provide even more shenanigans with the Amalgam/Haunted Dead package. Just the Wind and Ishkanah are used in single copies. Back at the coverage desk, Liliana, the Last Hope called out as the defining card of the tournament. Ruel is on a deck similar to the one Ali Aintrazi ran to 2nd place last week at SCG Baltimore. Jacob Wilson is on G/B Delirium. Ruel gets down a Liliana, only to get it answered with a Ruinous Path. Both decks running Liliana, and Jacob has both Grim Flayer and Ishkanah, Grafwidow. About ten turns into the game we find Wilson casting Emrakul, finding another Emrakul in Ruel’s hand. Eldrazi overlords for everyone! Wilson’s Emrakul is stolen by Dragonlord Silumgar, but Liliana and Grasp of Darkness take out the Dragonlord and Jacob is able to take Game 1 as Ruel draws dead. In a very grindy second game, at one point both players have Liliana and Nissa in play in planeswalker mode with Ruel also having a flipped Jace in play. Things grind on for a dozen or more turns with over a dozen permanents in play. Ultimately time is called, and the players enter the five extra turns. Wilson casts an Emrakul on Turn 3 of extra turns, giving him control of Turn 4, but forcing him to get rid of multiple potential attackers on the forthcoming Turn 5 to fend off the tie. Wilson moves to 6-1. 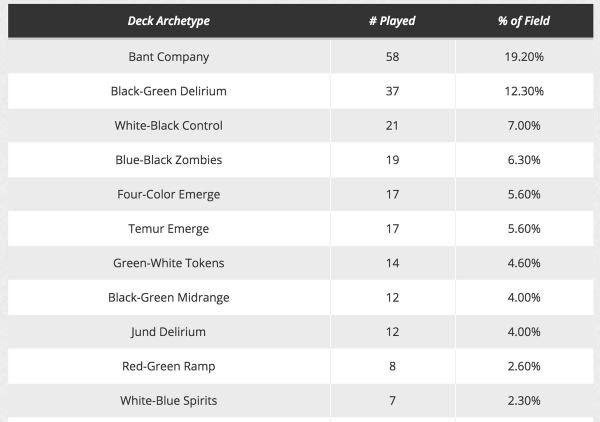 Note that the blue/green Crush of Tentacles deck from last weekend is nowhere to be found here, though it may have been a good choice facing this incredibly grindy meta. Shaheen calls out Emrakul as the best finisher in the format. Owen comes into this round at 7-0, while Steve is at 6-1. Turtenwald uses Emrakul to take Game 1, playing into the themes of the weekend thus far. In Game 2, Owen chains a pair of Elder Deep Fiends with Kozilek’s Return to wipe out Rubin’s opposing creatures and present serious pressure. Owen moves to 8-0 on the same day he is elected to the Hall of Fame. Talk about driving it home. See you guys tonight for Day 2! Thanks James all the relevant points covered. I think if the Temur Emerge pulls out ahead then that will put the breaks on Lilians’s price a little due to that deck not running them. Same goes for any bant company making top 8. Emrakul is in some decks as a 3 of and others as a 1 of, not sure there is enough play to keep it above $30 but its definitely not going below $20 for some time. Agree on that forecast for Emrakul, cheers. Awesome job with the coverage. I believe you beat everyone too it. good stuff. Just to Note, It was not a reality smasher off the top for Dickman as the coverage team believed. Dickman had a lumbering falls in play. Which made the loss more brutal, since Drad had to take 2 damage in order to cast the languish.